Guess what, another on pack promotion – a promotional mug. We have seen this in numerous occasions now and all of them come from milk / dairy companies. It is becoming something essential to include in our promotions as people will be expecting this now and if not included they will be disappointed and might switch to another brand. Another gift with purchase promotional offer in France. Milka, the world famous instant-chocolate company, is running this online promotion. Below we can see an image of the promotion that includes this expected promotional mug and how it is customized in terms of printing. 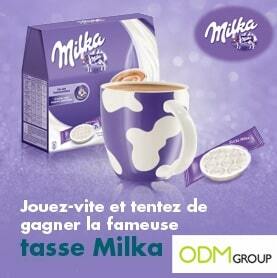 Where is this promotional mug offer advertised and what is the expected impact to Milka´s marketing? By providing customers with a promotional gift like a promotional mug from which they will benefit regularly while displaying the logo and colours, Milka implemented the perfect promotional strategy. If you need to discuss a specific campaign related to milk promotions or other topics, our design team would be happy to brainstorm the coolest items in the market for you and also new concepts to impress your customers.